Ever heard or tried this red date tea? This is a kind of Chinese traditional herbal soup. 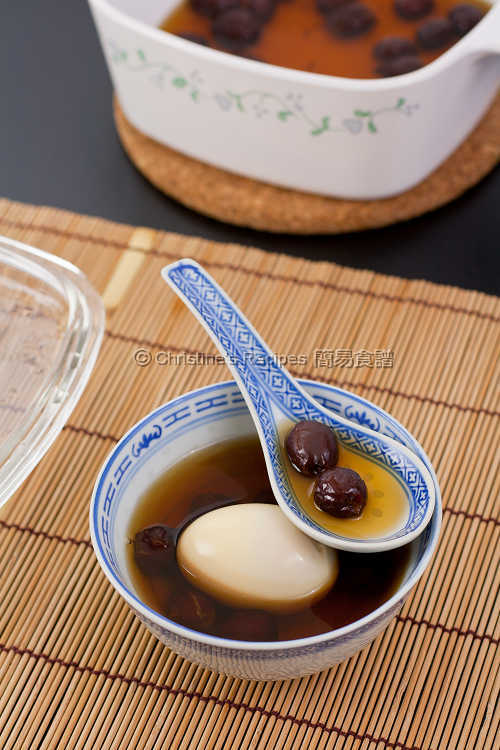 Chinese believes that red dates (紅棗) are very good for women’s health. Oh, well, pardon me. If you’re a male, skip this recipe, or pass it to your female friends. Red dates contain much iron that can help women get speedy recovery from delivery and menstruation. Apart from the said medical effects, red dates also can help improve skin become tender and smooth. No wonder many Chinese women like to have red dates tea once for a while. This old-fashioned recipe, passing down from generation to generation, is handed down by my mother and mother-in-law. Love to make it known to my dear daughter as well. Rinse red dates thoroughly. Drain well. Set aside. Put water and red dates in a saucepan. Cook over medium-high heat and bring it to a boil. Reduce heat and simmer for about 45 minutes, until about 1 rice bowl of water left. Carefully place an egg in a small saucepan. Cover with cold water. Bring to the boil over medium heat. Reduce the heat and simmer gently for 3 minutes for a runny yolk, or cook for a longer time according to your preference. Drain the egg with a slotted spoon. Immediately transfer to a bowl of very cold water. Leave it to cool and peel off the shell. Transfer back into the saucepan of red date tea. Warm the egg up a bit. Done. Serve immediately. The sweetness of this tea is just right. If you’d like to have it sweeter, add some rock sugar while you cook the red dates. This recipe calls for dried red dates without pits. If you can only get whole red dates with pits inside, simply soak in water until they become soft, then you can remove the pits with a pair of scissors very easily. Normally, you need about 15 to 20 pitted red dates to make one serve. I like to have rich red date flavour, so I used 30 of them. Feel free to adjust the amount of red dates used. I made some this week too, but with addition of 'dong quai' added. 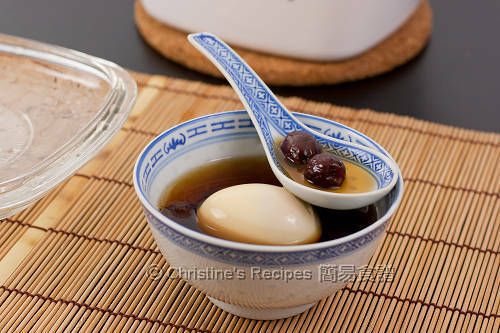 I never thought just to do it with just egg and red dates. Dong quai makes it a lot more bitter so your recipe sounds a lot tastier! I usually skip the egg and just drink the red dates drink on its own. Love it! Are these dates same as the korean jujube dates? This looks very familiar :D It's one of my favourites during confinement. Nutritious and yet convenient to prepare, because I also like it go without an egg : ). I am excited about this recipe because if these red dates are the same as the jujube ones, I just saw some at the market today! In Lebanon jujube dates are eaten fresh but this is a lovely tea and I will cook them like this as well! Use dried jujubes / red dates as fresh ones don't have the same effect. Must. Be pitted too otherwise will be sour. Thank you for this recipe. I love the idea of adding more red dates to skip the sugar. It's definitely a healthier alternative. I casually asked my Chinese physician about drinking red dates tea during menstruation and she said it's a good idea as well. But I'm on my Chinese herbs at the moment and don't need 'extra' nourishment. Will be great to start drinking this regularly once I'm off my medication. This drink is nourishing and I love the addition of eggs which are not that common here. Red date tea reminds me of Chinese wedding and Chinese New Year. It is only then I see the tea being served. Hmm...maybe I have seen eggs being added to red date tea for Chinese wedding but really not that common unless on special occasions. That's an excellent recipe Christine. Thanks for sharing! I'm going to try it. My mom usually cooks this for me when I back to HK but without egg. Thanks for sharing this! I know you're not a medical practitioner, but as tradition goes... Would this be ok to drink if you're pregnant? Or only good after delivery and period? Of course I won't hold you liable for anything. Just curious, since I no longer have anyone to ask about these things. Thanks! For me, it's no problem at all. This tea is very mild and natural. If anyone has food allergy or high blood sugar, then they might like to stay away from it. I think you can experiment with your pressure cooker. I haven't tried yet though. This tea is for women traditionally. Actually it's good for anybody, as long as they don't have any food allergy or special health concerns. just wonder if you can do all of those in Instant pot. I haven't tried this recipe with my Instant Pot yet.